The head of Kiev junta, Poroshenko, has criticized the upcoming Dutch referendum on the question of Association between Ukraine and the European Union. The referendum on The Agreement on Association between the EU and Ukraine is planned for 2016. This event will take place only if at least 30% of the voters will participate in the voting. The most unpleasant for the junta was that the decision to hold the referendum has automatically suspended the approval of the law about the Agreement on Association between the EU and Ukraine. In other words, by this step The Netherlands suspended the ratification of the document. The Dutch government politely says that all issues relating to the ratification will be discussed only after the vote. 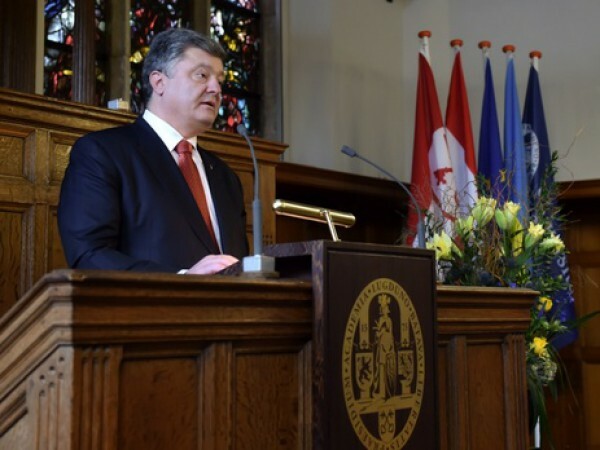 In response to this move, Poroshenko addressed the students of the Netherlands with a speech. “Many Europeans are tired. Unfortunately, many think ‘enough of this, give the Kremlin what it wants’. These Europeans call themselves eurosceptics. At the time, in reality, they are eurocowards,” stated the head of the Kiev junta. He added that the war in Ukraine ruined the trust to this country: “Donbass and Crimea did not only ruin the trust in Europe, it formed a new divide in Europe”. This entry was posted in News from Ukraine and tagged Europe, Netherlands, Poroshenko, Ukraine. Bookmark the permalink.